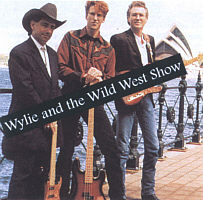 Wylie & the Wild West - one of America’s most popular Western entertainment groups. They are pictured in front of the Sydney Opera House with their Tomkins instruments. 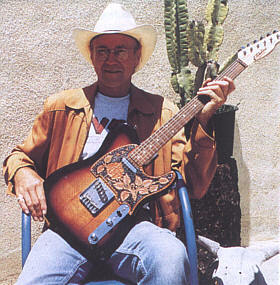 Guitarist Ray Doyle with his Tomkins Diamondtina guitar. Wylie - vocals & bas guitar Mike Fried - steel guitar Ray Doyle - guitars/harmony vocals Kenny Griffin - drums Stuart French - electric guitar 7320092 Recorded at Rocking Horse Studios, Byron Bay 'in the watertank'. Greg Courtney - engineer. Mixed at Glebe Studios, Sydney. Colin Simkins - engineer. Mastered at Studios 301 by Steve Smart.